It's that time of year again. The cold-stunned turtles are feisty and looking good. Turtles have been off their medications for a while. Some turtles have started diets. Regular exams show no significant findings. The final piece... the temperature off the Florida coast has become warm enough to sustain our rehab patients. The three vehicles getting readied for the transport. This morning at the Quincy Animal Care Center we packed up thirty one turtles to head back to the ocean. 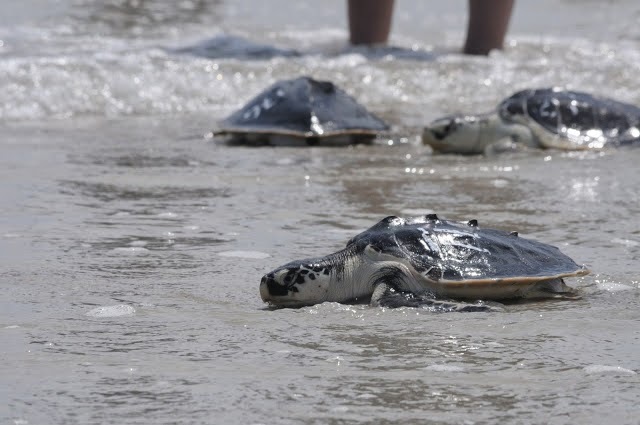 Among this group are two loggerhead, one green, and twenty eight Kemp's ridley sea turtles. First thing we need to do is start getting turtles out of the rehab pools. Two teams are set up to start capturing the turtles. Volunteers Dave MacLean(L) and John Lyons pull out one of our juvenile Kemp's ridley sea turtles. One of the two loggerhead sea turtles heading south 089 or "Baron Von Redberry" being placed into its travel crate. In the crate shown below. Then the turtles enter an assembly line of sorts. Here they get their unique ID number placed on the transport box. They are then lubricated with a water based lubricant (so that they can stay moist for their almost 24 hour road trip). Foreground: Turtles get lubricated on their "soft" skin areas which include the neck and flippers. In the background you can see the animal ID being written on the box. Then the box gets cable tied so that the inhabitants are unable to get out. They are then swiftly moved to a heated vehicle.Where each turtle is placed in a specific way. To the left and above volunteers Elizabeth Linske and Shannon Wood swiftly move the turtle out of the facility and into the back of one of the waiting transport vehicles. Turtles and supplies are packed to optimize temperature and air flow for our patients. One last safety briefing before heading out. Three Kemp's ridley sea turtles from last years Florida turtle release. More photos from the release.